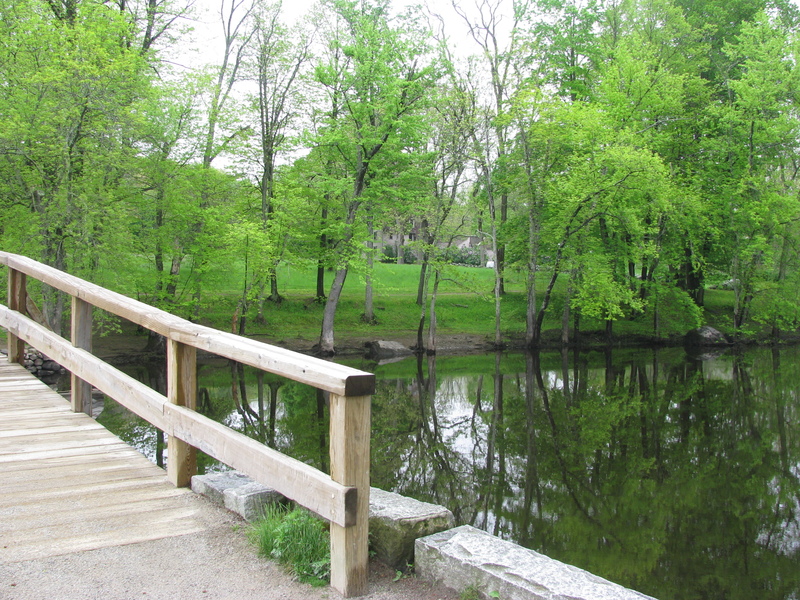 The North Bridge, Concord, Massachusetts. This was where the American Revolutionary War began in 1775. It is hard to image that a war started in such a beautiful place. Through the trees you can see the Old Manse, a home constructed by Ralph Waldo Emerson’s grandfather. This home was vital to the transcendentalist revolution that began in the 1830s. In one spot you can see two key places for two types of revolutions in America. This entry was posted in Travel, Travel Photos and tagged American history, Concord, Massachusetts, Nature, North Bridge, Old Manse, Photography, Photos, Ralph Waldo Emerson, Transcendentalism, Travel Blog, Travel Journal, Travel Photo. Bookmark the permalink. Yes it looks very peaceful now, serene and green. It is a great place to visit. I was there during the spring and loved all the life there. Interesting juxtaposition, to see such a peaceful looking nook and then read of its role in the American Revolution. Thanks Jack. It is odd to be surrounded by beauty and then try to imagine a battlefield. Thanks Meredith! Hope all is well in Montana. It’s so green it almost looks unreal doesn’t it? What a lovely pic! Hi Lynn. That was one of my favorites parts about the area…all the greenness. This bridge has been rebuilt on many occasions. The most recent time was in 1956. That is a little pretty for a war….great shot TBM. It seems so peaceful now. Hard to believe it was the sight of war. I know what you mean Fergie…such a pretty spot I don’t want to imagine war there. Look at those greens. And to think that this used to be a central place during the Revolution. Makes you wonder, doesn’t it. It really does make me wonder…war always makes me wonder. Are you going to show us Walden Pond as well? Such a beautiful and historical place! Yu are right, how can a war start in a place as beautiful as this! I don’t know…but I think I would say that about many places. War is filled with death and horror and nature is so serene and beautiful. Life is full of puzzles. I’ve been here many times (I’m from Lexington). It’s a very lovely and peaceful place. Nice photo! I love Lexington and the surrounding area. It is so pretty! That looks so luscious! We don’t have this color of green in Southern California, where it rains maybe 6x a year. I grew up in Southern California. I think that is why I love the rain so much since it hardly rained during my childhood. San Diego is one of my favorite cities. I grew up in Orange County. Thanks for the stopping by!